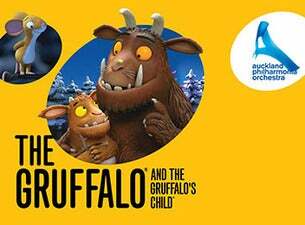 Enjoy these enchanting films, based on the books written by Julia Donaldson and illustrated by Axel Scheffler, on the big screen complete with Rene Aubry’s magical music score performed live by the Auckland Philharmonia Orchestra. The Gruffalo tells the story of a mouse who goes in search of a nut. Along the way, he is confronted by several hungry animals who invite him home for a meal, but the mouse is far too cunning to fall for their tricks! The Gruffalo’s Child follows the adventures of the Gruffalo’s young daughter who, one wild and windy night, ignores her father’s warnings and bravely tiptoes out into the snow in search of the Big Bad Mouse.